Print Crinkle Square Neck Maxi Dress is rated 4.0 out of 5 by 1. The Crinkle Square-Neck Maxi Dress is the perfect addition to your summer wardrobe. 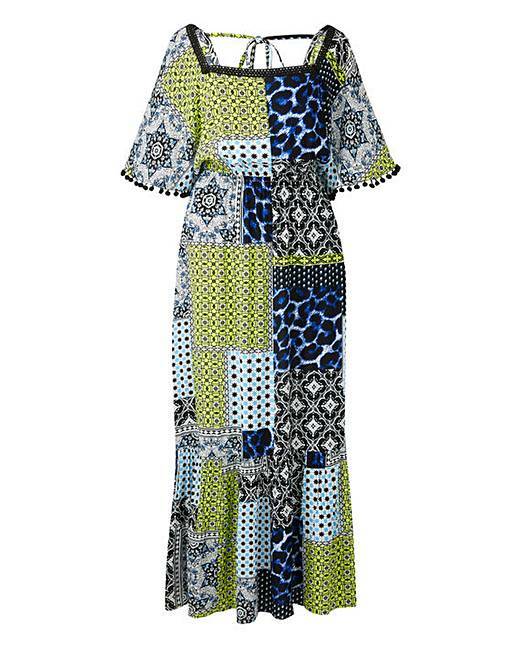 Adorned in a gorgeous turquoise print this maxi dress features a square neck and tie back detailing. Made from a lightweight breathable crinkle fabric, this dress also features a gathered waistband clinching the waist, accentuating your curves and creating the illusion of the perfect hourglass figure. Rated 4 out of 5 by Janeyangel from Go a size smaller Really slimming dress but go a size smaller or maybe even 2. I bought a size 22 (my normal size) & the top half of the dress was massive. The bottom is very flattering so I shall be reordering another in a smaller size. Knocked a star off due to not being true to size.